(Phys.org)—A trio of Australian researchers is proposing in a paper they have had published in the journal Proceedings of the Royal Society B, that using a technique developed to prevent the spread of wildfires might also help slow the spread of an invasive species. They have created a computer model that shows that using backburning inhibits the spread of a virtual organism. One of the techniques forest or bush firefighters use to halt the spread of a fire is backburning, where controlled fires are set ahead of the path of the encroaching blaze—once the original fire reaches the area of the controlled burn, it stops, because all of the fuel in the area has already been burned. 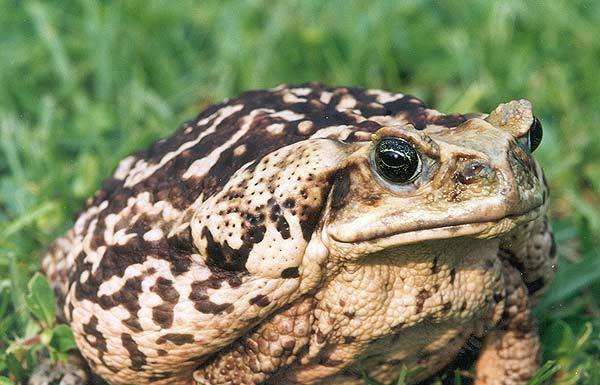 In this new effort, the researchers wondered if a similar approach might not work to help slow the spread of an invasive species, such as cane toads, which were introduced into Australia back in 1935—since that time they have spread from areas in Queensland, where they were supposed to help battle beetles that were causing major problems in sugarcane fields. Unfortunately, the poisonous frogs proved to be heavily invasive, moving and taking over territory formerly inhabited by other species. Previous research has shown that for most invasive species there are some individuals in a group that are more invasive than others—it is the individuals out front that are mostly responsible for the spread into new territory. But, what if those individuals that were strong and healthy, but who were not necessarily all that interested in moving to new territory, were artificially moved to areas ahead of where the invasive species was believed to be moving? If they multiplied in that area and were there when the rest of their group arrived later, they would outnumber the incoming crowd and overwhelm them, and in the process, cause a reduction in the degree of invasiveness of the group as a whole. To find out if such an idea were even worthy of consideration, the team created a virtual world as part of a computer simulation, filled with virtual hermaphrodite creatures. Some were programmed to be eager invaders, while others were programmed to be homebodies—the eager creatures were placed at the outskirts of the two-dimensional world where they would naturally attempt to march into new territory. Once the virtual world was set in motion, the researchers than moved some of the homebody creatures to an area where the group was clearly set to invade, and then watched what happened. The team reports that the invasion was clearly slowed by the technique and are now wondering if it might work in the real world. There is no word yet on whether authorities in Australia will allow such an experiment, but if they do, and the plan works, the technique will undoubtedly be tried in other areas as well. The impact of an invasive species depends upon the extent of area across which it ultimately spreads. A powerful strategy for limiting impact, then, is to limit spread, and this can most easily be achieved by managing or reinforcing natural barriers to spread. Using a simulation model, we show that rapid evolutionary increases in dispersal can render permeable an otherwise effective barrier. On the other hand, we also show that, once the barrier is reached, and if it holds, resultant evolutionary decreases in dispersal rapidly make the barrier more effective. Finally, we sketch a strategy—the genetic backburn—in which low-dispersal individuals from the range core are translocated to the nearside of the barrier ahead of the oncoming invasion. We find that the genetic backburn—by preventing invasion front genotypes reaching the barrier, and hastening the evolutionary decrease in dispersal—can make barriers substantially more effective. In our simulations, the genetic backburn never reduced barrier strength, however, the improvement to barrier strength was negligible when there was substantial long-distance dispersal, or when there was no genetic variation for dispersal distance. The improvement in barrier strength also depended on the trade-off between dispersal and competitive ability, with a stronger trade-off conferring greater power to the genetic backburn.